The report can be download from our Download section. More case studies are uploaded in FIORDA database. To become FIORDA member please contact us. Ammonia plant start-up was in progress after of cold shut-down for maintenance work. The synthesis gas compressor was started at 5:30 p.m., and the electrical start-up heater was activated at 7:00 p.m. Liquid ammonia product export to the storage at 4:30 a.m. Morning shift operator and the shift supervisor did their routine synthesis gas compressor check. Nothing abnormal was observed. At 8:30 a.m., the production rate was stable at approx. 900 MTPD and the team was preparing the start-up of the purge gas treatment unit. The plant was in steady state operation, and all process parameters of the ammonia synthesis section were normal. At 8:33 a.m., three fire detectors located in the compressor room alarmed simultaneously. The alarm is reported both in the control room and in the site fire station. At 8:34 a.m., the synthesis section emergency shut-down was activated manually from the control room. At the same time, the site fire brigade left the fire station. At 8:43 a.m., as the fire was developing, the operators realized that there was a risk of extension of the fire. The plant was tripped completely, and the natural gas cut-off valve was isolated. The control room operators started to depressurize the process gas through the vents. Around 8:45 a.m., the emergency management team was set up in the administration building. The civil fire service was called to support the site firemen. At 8:57 a.m., the roof of the building, partly consisting of transparent polycarbonate plates, began to burn producing a heavy, black smoke. The smoke could be seen several kilometers away. The fire then propagated to the process gas vents located nearby. At 9:00 a.m., the west wall of the compressor room, made of concrete blocks, collapsed, and the gas fire, which up to now was contained inside the building, escaped outside, threatening the main pipe rack. All the plant personnel, with the exception of the firefighting team, were evacuated and sheltered inside the blast-proof control room building. At 9:06 a.m., the civil fire brigade arrived on site and up to 70 firemen were prepared to support and replace the site firemen, if necessary. At 9:17 a.m., the site firemen established fire hoses outside the building to protect the main pipe rack. At 9:24 a.m., the synthesis loop residual pressure was less than 1 MPag (150 psig). At this point a 2 MPag (300 psig) nitrogen hose was connected to the loop in order to inject inert gas. At 9:55 a.m. (1 hour and 22 minutes after the incident start) the fire was totally extinguished. The action of the civil fire brigade was no longer required. Immediate response action The synthesis section emergency shut-down was activated manually from the control room followed by total plant shut-down. The immediate cause of the incident appears to be a hydrogen-rich gas leakage on a 1 inch ASME class 2700 lb, welded bonnet, forged steel valve located on the by-pass line of the synthesis gas compressor main discharge valve. 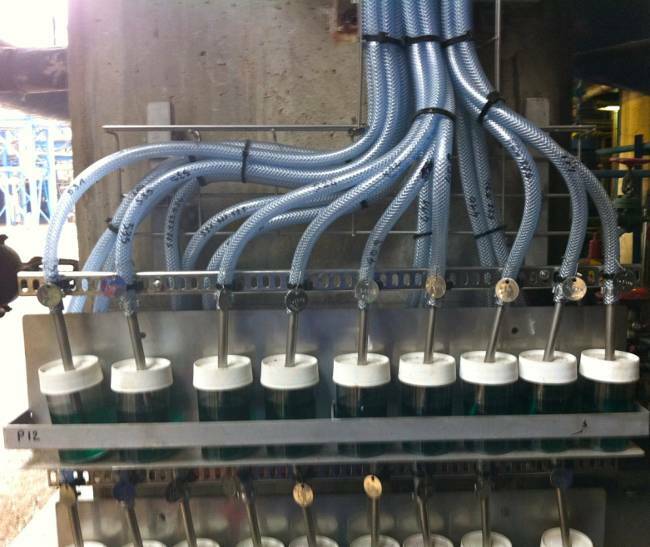 This manual valve is operated during each plant start-up in order to pressurize the synthesis loop. Sequence of Events:1. Appearance of gas leakage on the packing.2. Ignition of the gas, the jet fire impinges on the 1 inch pipe downstream the valve.3. Pipe material overheats.4. Creep failure of 1 inch pipe.5. The gas leakage and fire intensity increases considerably.6. Immediate rupture of nearby ¾ inch pipe.7. 1 inch pipe bends, with a jet fire directed towards the wall.8. Building steel structure overheats.9. Wall collapses.10. The fire escapes outside the building towards the main pipe rack. Root Cause: The investigation concluded the only possible failure mechanism was as follows:1. Grooved rivet (#35) was missing.2. 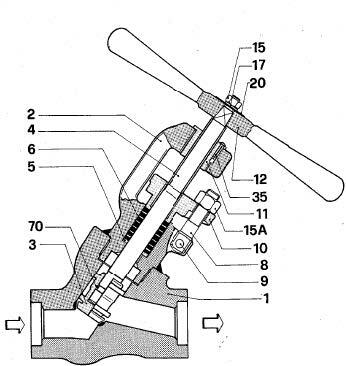 Nearly complete unscrewing of the yoke bushing (#11) during operation of the valve.3. Rupture of the last thread as a consequence of the internal pressure rise during the normal start-up process.4. Vibration of the stem (#4) and loss of tightness of the packing.5. Gas leakage and ignition. The wall in front of the compressor collapsed from top to bottom. The steel structure of the building was damaged and thermally affected. The roof plates above the compressor were damaged and partially burnt. The outside wall covering in Eternit was destroyed and broken into small pieces, which were sprayed all over. Because this material contains asbestos, all the debris had to be cleaned up before the investigation and repair work could be started, causing about three weeks of delay. 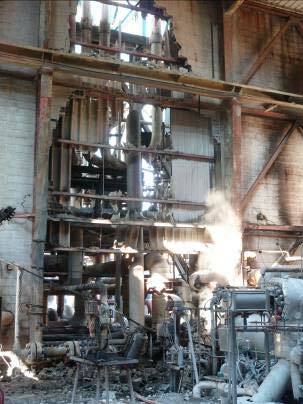 The instrument and lubrication lines were damaged by the fire and the debris. The control cabinet was totally burnt. The floor grating was distorted. The main compressor discharge line was apparently intact, only the small bore piping was damaged. Two small process lines were broken. The piping in the main pipe rack was impacted by the fire but had not failed (except for small steam tracing and instrument air lines). 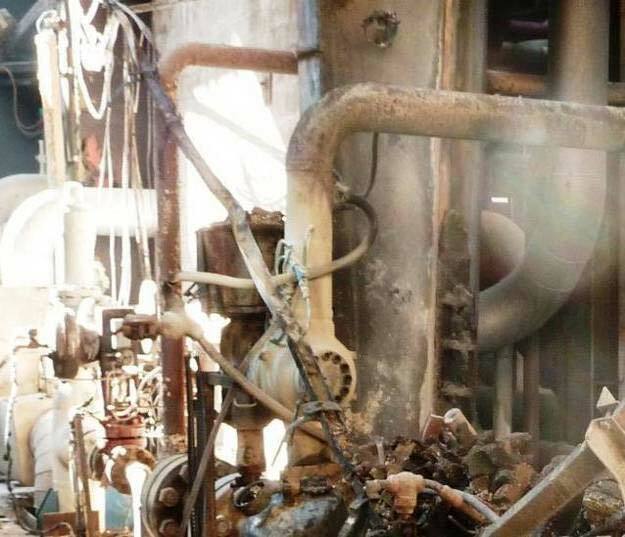 Inside the building in the compressor area, control valves with their actuators were damaged or destroyed, and transmitters and their connecting cables were destroyed. Inside the building in the compressor area and in the main pipe rack in front of the building cable trays were impacted by fire and partly destroyed. None for this type of failure. Include all flammable gas lines, regardless of size and operating pressure, in the plant inspection program. Perform a complete inspection of these lines before startup. A complete visual inspection of all manual valves on flammable gas lines was also performed. This inspection was conducted together with a valve specialist, a pressure vessel inspector, and a plant operator. Lesson Learned Do not underestimate the size and operating pressure of flammable gas lines and associated isolation valves by non-including these equipment in periodic inspection program.